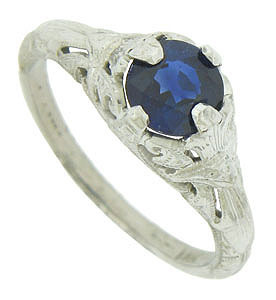 A deep blue 1.05 carat, round cut sapphire is set into the face of this elegant 14K white gold engagement ring. Intricate layers of abstract organic cutwork cover the sides and shoulders of the mounting. 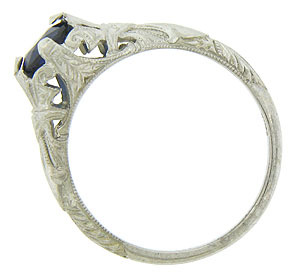 Detailed engraving adds depth to the spectacular ring. The ring measures 7.07 mm in width. Size 6. We can re-size.